I'm sorry, but I love my son. A group of friends float through the sea on an overturned boat. They've been caught in a storm, and they don't know where they are or how to get back to land. Jess (Melissa George) is a single mother with an autistic child who just wants to get home. Greg (Michael Dorman) is the owner of the boat who might have romantic feelings for Jess, and is trying to stay calm. Victor (Liam Hemsworth) is Greg's shipmate, and will follow him to the ends of the Earth. Sally and Downey (Rachel Carpani and Henry Nixon) are a couple who wanted to set Greg up with a friend of theirs, only for that friend to get lost in the storm that capsized their boat. 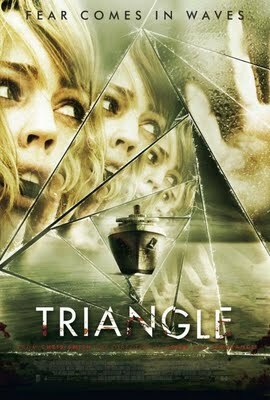 I wasn't a big fan of director Christopher Smith's previous film, Severance, a comedy-horror which I thought wasn't particularly funny or scary, but Triangle really surprised me. It lures you in with a fairly standard "people become lost and discover an abandoned X" plot, only to turn it into a surprisingly clever science fiction story in which the same basic events are repeated from different perspectives, presenting the pieces of a mystery to the audience out of sequence. As Jess tries to figure out just what is going on in order to break the patterns of behaviour that keep leading to the deaths of her fellow survivors, we get an insight into who Jess is, and just what she will do in order to get back to her son. As Jess, Melissa George delivers a really solid performance that anchors the film and prevents it from drifting off into dry science fiction. Her determination feels very real, and her mental degradation as the film progresses and she repeatedly fails to stop her friends dying would be much less compelling if it didn't have such a convincing performance behind it. The rest of the cast are okay, but since their main task is to get killed repeatedly, they can't be blame for not dazzling us. Smith has a firm hand on the horror conventions, delivering a fun mix of suspense and jump scares,and he even manages to deliver a couple of emotional sucker punches that rely on scenes being reinterpreted when we are presented with new information, but there are times when the horror director in him takes over and he sacrifices narrative cohesion for a scare. Specifically, there is a scene in the film where he conjures up a really striking and horrific image that in the moment is very effective but doesn't make sense in terms of the time loop structure. It doesn't ruin the film, but the plot is so considered that this moment stands out like a great tear in an elaborate tapestry. It's rare to find a horror film which has had as much thought and care put into its script and overall structure and which, more importantly, is still scary. Genre fans would be well advised to check this film out so you have a better sense of what everyone else is doing wrong.